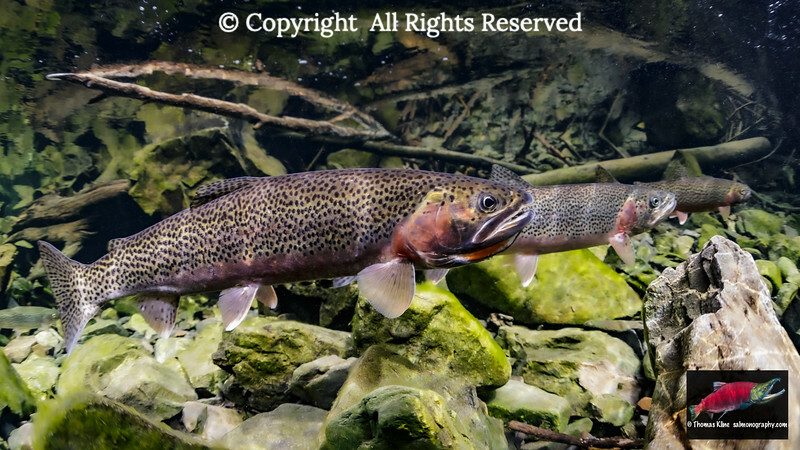 Cutthroat Trout (Oncorhynchus clarkii) at one time consisted of more than one dozen subspecies distributed throughout western North America. 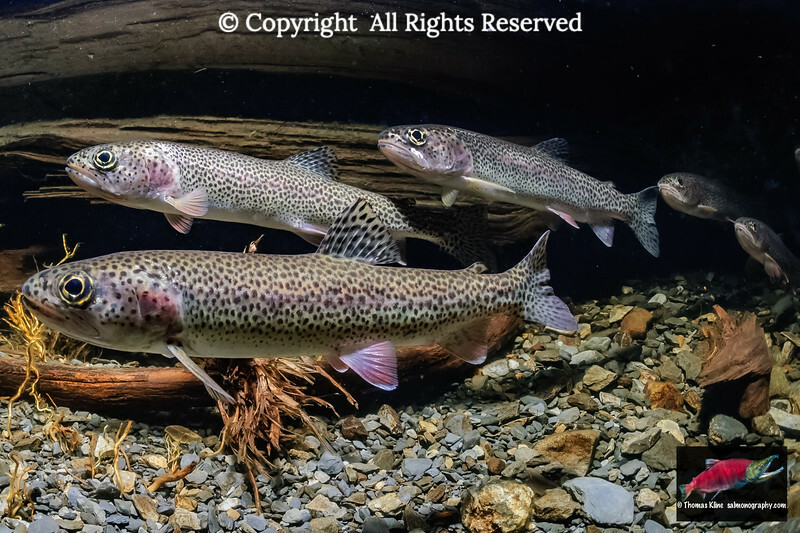 The Coastal Cutthroat Trout (Oncorhynchus clarkii clarkii) is the subspecies that lives in conjunction with temperate rain forests. 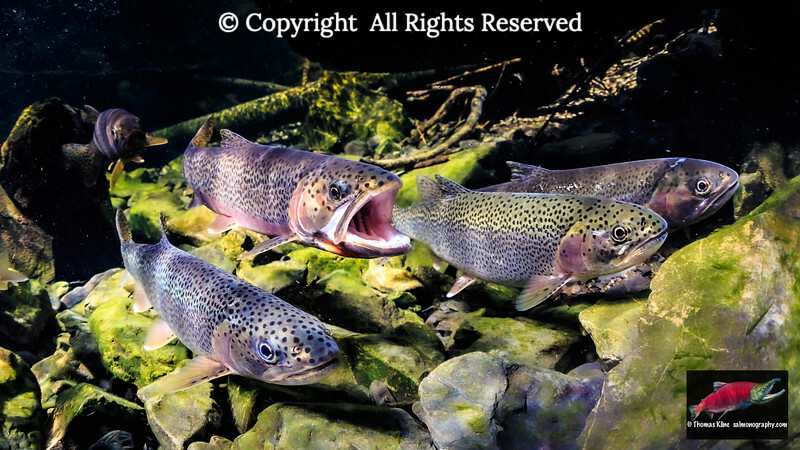 It is the only subspecies that enters salt water. 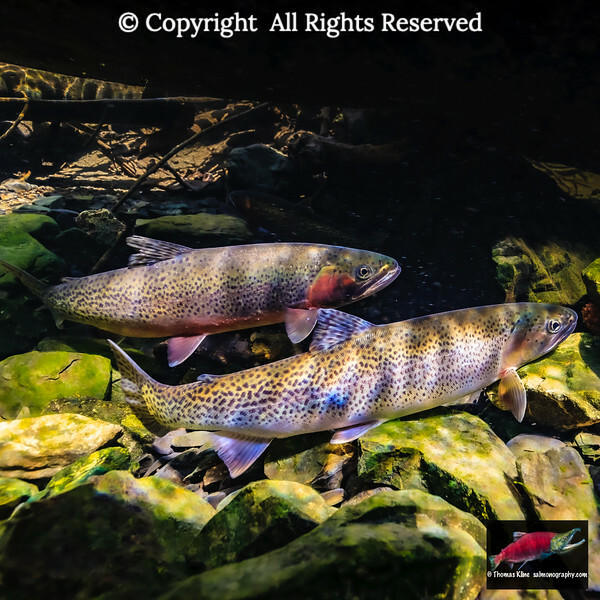 Those that do are known as Searun Cutthroat Trout. 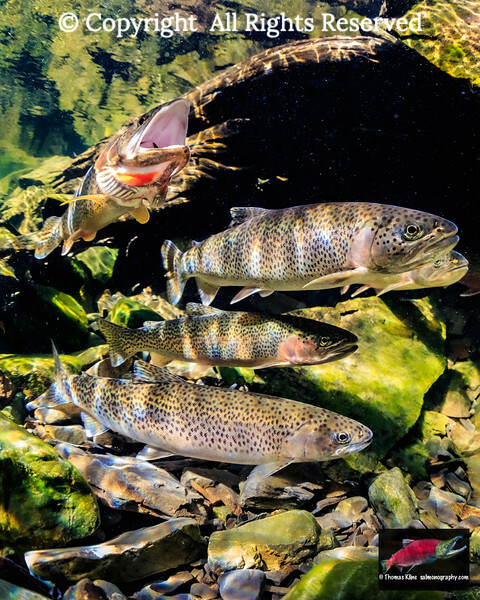 A given Coastal Cutthroat Trout population can include searun as well as several freshwater resident forms or ecomorphs. 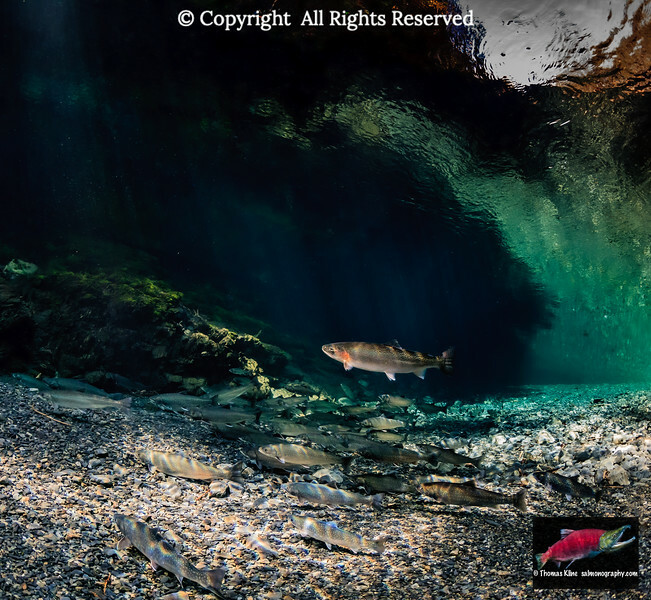 The northern biogeographical limit for the species is Prince William Sound, Alaska, near to where these images were taken. 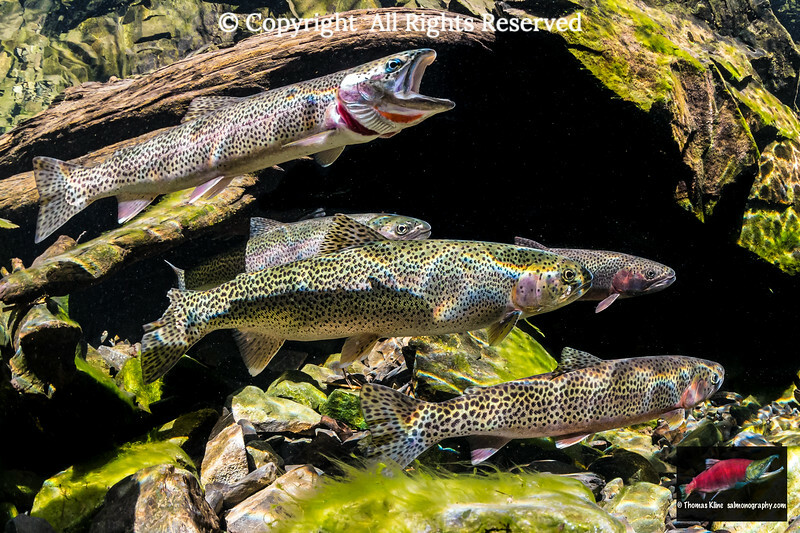 Unlike their Pacific salmon congeners, Cutthroat Trout are iteroparous. 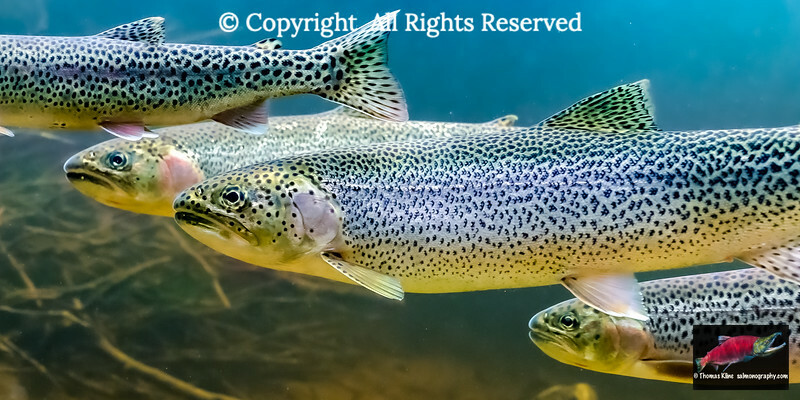 A healthy population will have many repeat spawners. 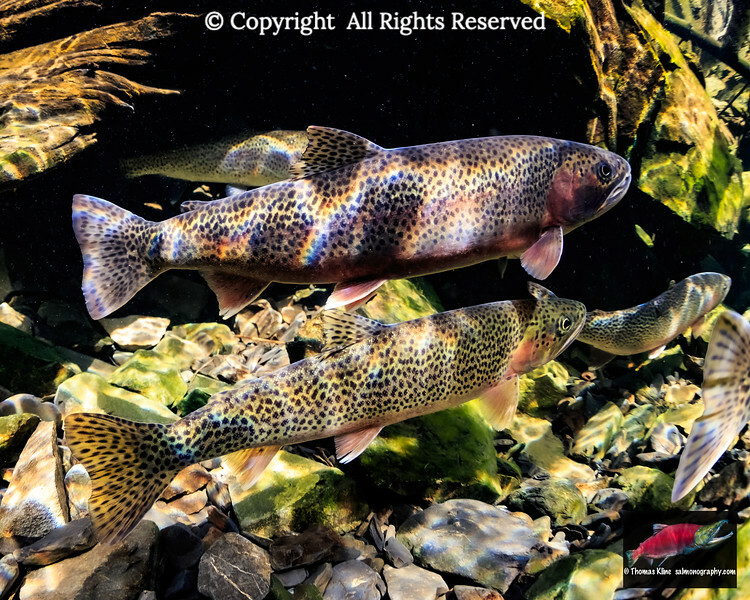 Searun Coastal Cutthroat Trout (Oncorhynchus clarkii clarkii) males in nuptial coloration. 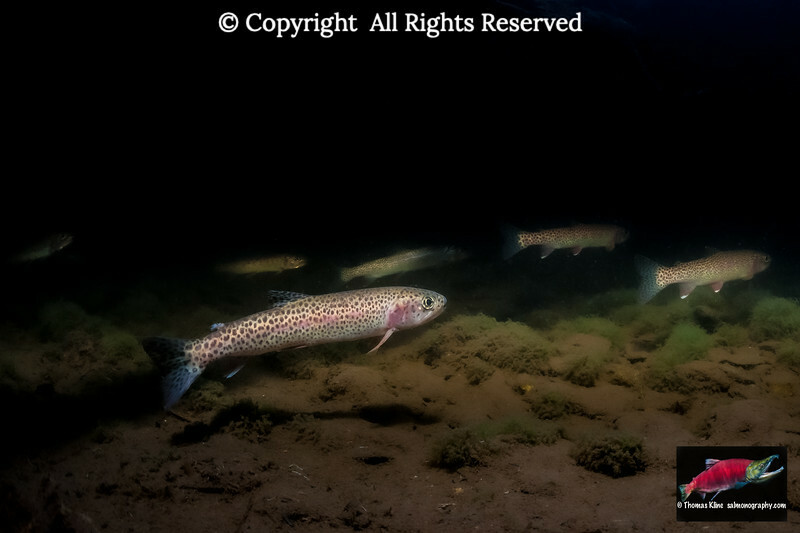 Coastal Cutthroat Trout (Oncorhynchus clarkii clarkii) in a Copper River Delta, Alaska stream that is turbid with glacial sediment. 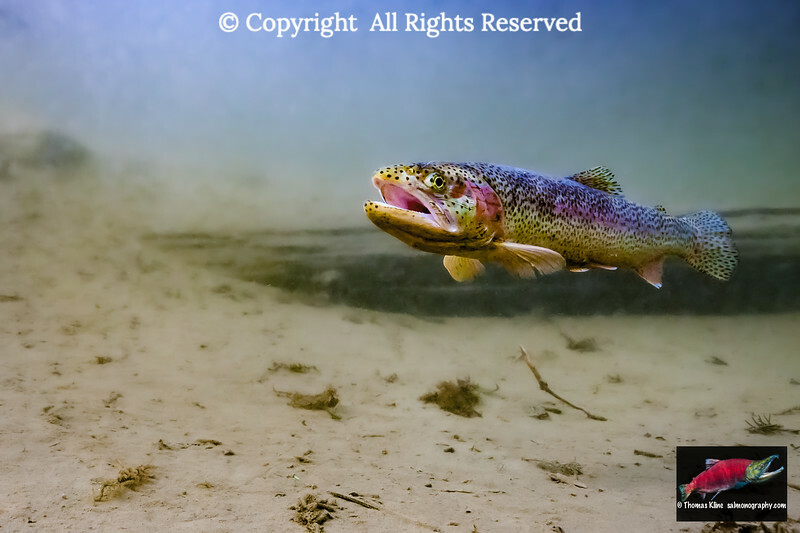 Gaping Searun Coastal Cutthroat Trout (Oncorhynchus clarkii clarkii) revealing its right red slash, the feature which led to this species' common name. 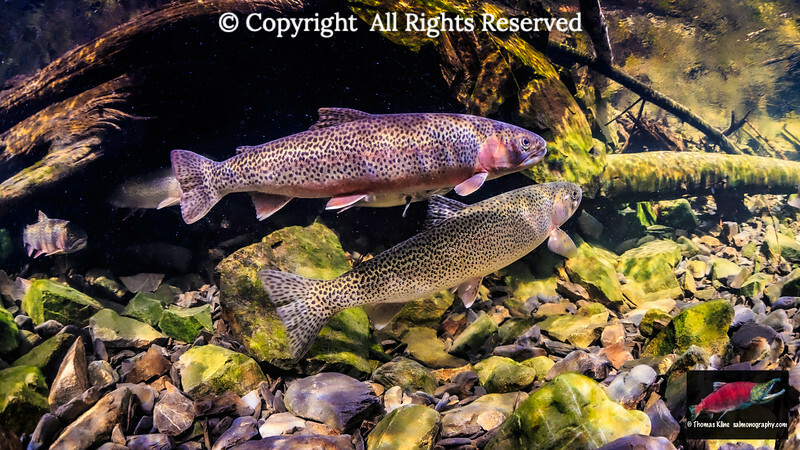 Coastal Cutthroat Trout (Oncorhynchus clarkii clarkii) female flanked by two prospective mates. Shooting at ISO 25,600 made this shot possible. 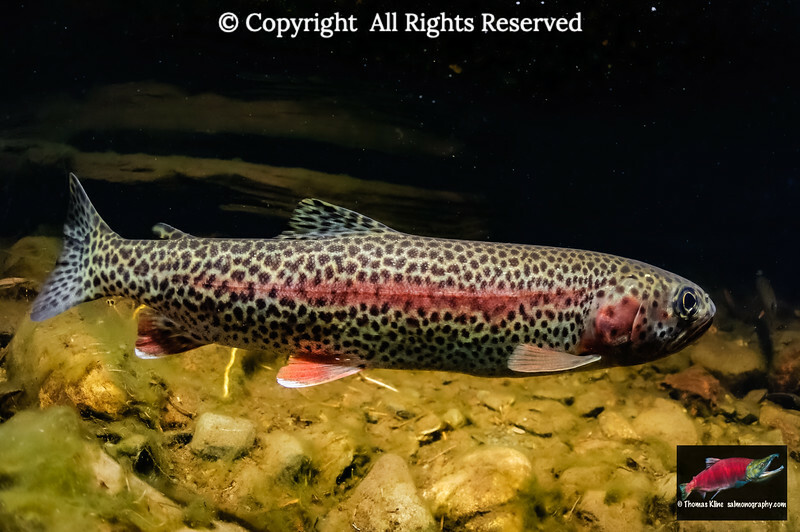 Male Searun Coastal Cutthroat Trout (Oncorhynchus clarkii clarkii) aggressively defending his position in a stream by displaying his red throat slashes while chasing away an intruding female. 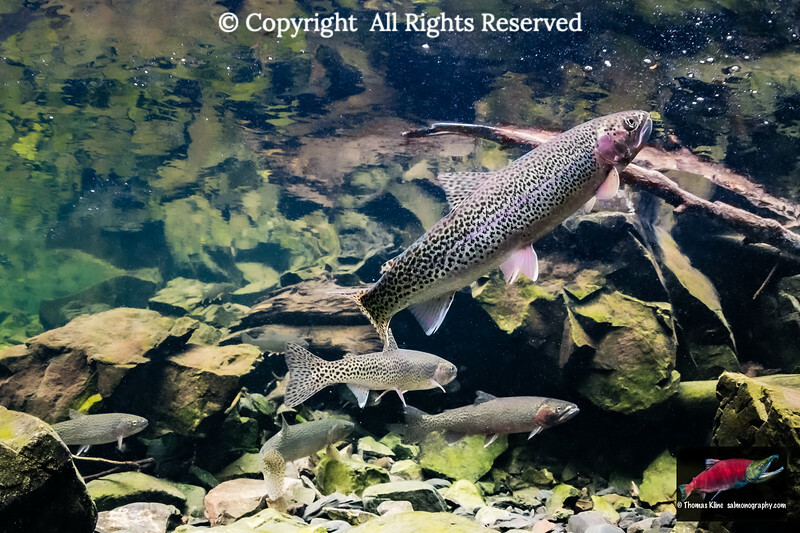 Male Searun Coastal Cutthroat Trout (Oncorhynchus clarkii clarkii) gaping during spawning migration is asserting his position in the stream. 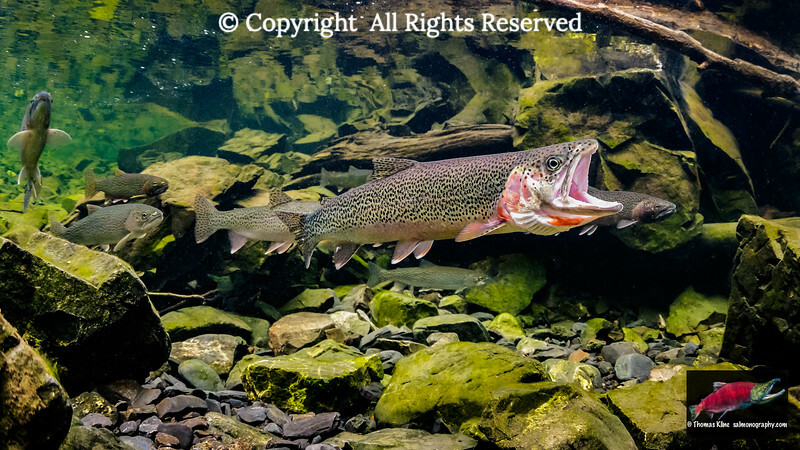 Male Searun Coastal Cutthroat Trout (Oncorhynchus clarkii clarkii) challenging another fish by using the flared throat aggressive display, which reveals the red slashes giving the species its name. 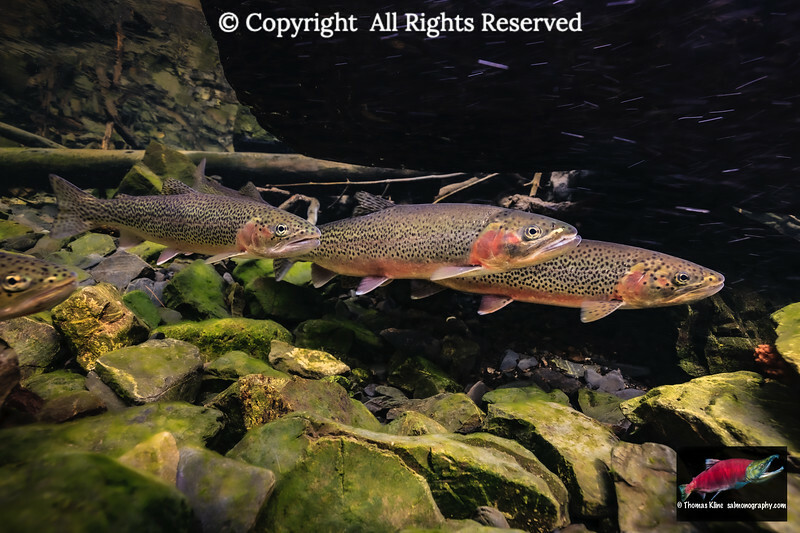 Searun Coastal Cutthroat Trout (Oncorhynchus clarkii clarkii) spawning rmigration. 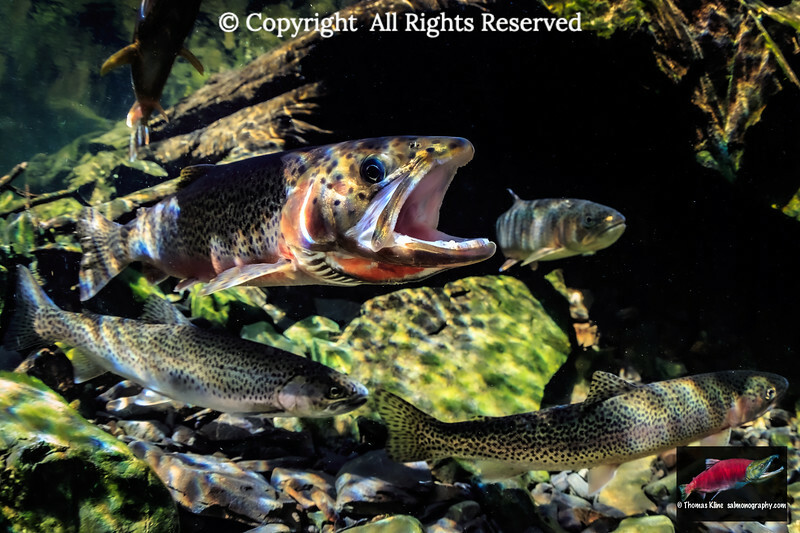 Gaping Searun Coastal Cutthroat Trout (Oncorhynchus clarkii clarkii) reavealing vomer and palatine teeth in roof of mouth and red throat slash. 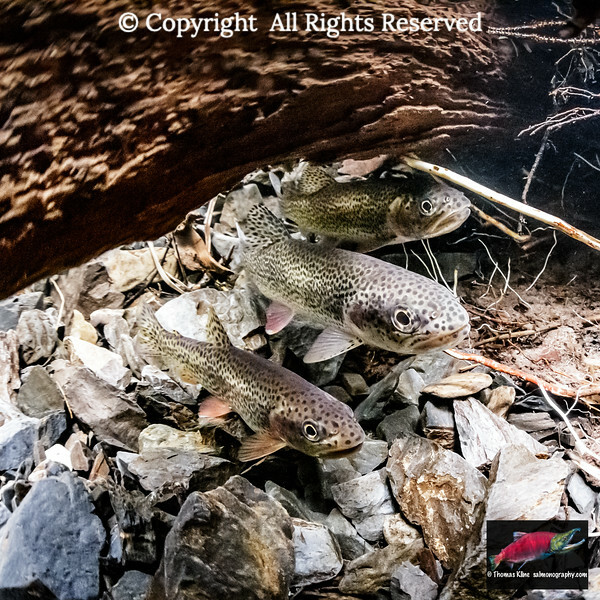 Coastal Cutthroat Trout (Oncorhynchus clarkii clarkii), Dolly Varden (Salvelinus malma), and Coho Salmon (Oncorhynchus kisutch) near a beaver lodge. Aspect Ratio = 2:3. 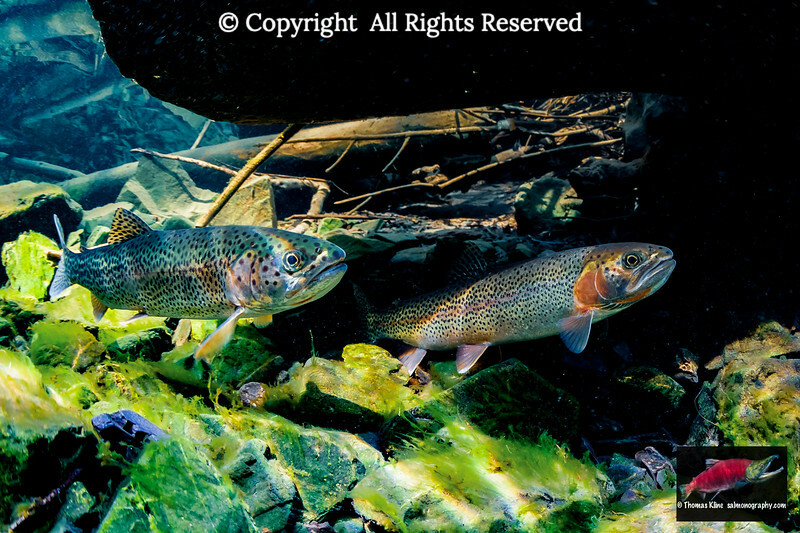 Searun Coastal Cutthroat Trout (Oncorhynchus clarkii clarkii) pair in a small tributary of Prince William Sound, Alaska. Aspect Ratio = 2:3. 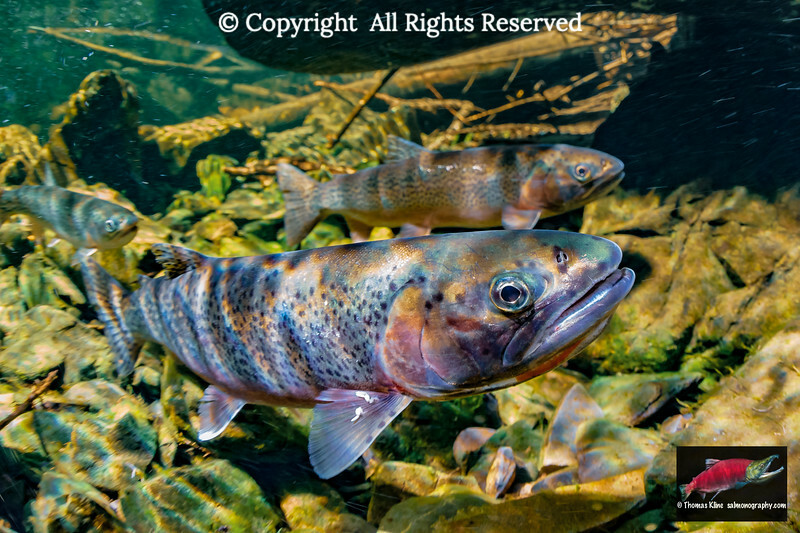 Searun Coastal Cutthroat Trout (Oncorhynchus clarkii clarkii) male signaling a female by his raised head posture in a small tributary of Prince William Sound, Alaska. Aspect Ratio = 2:3. 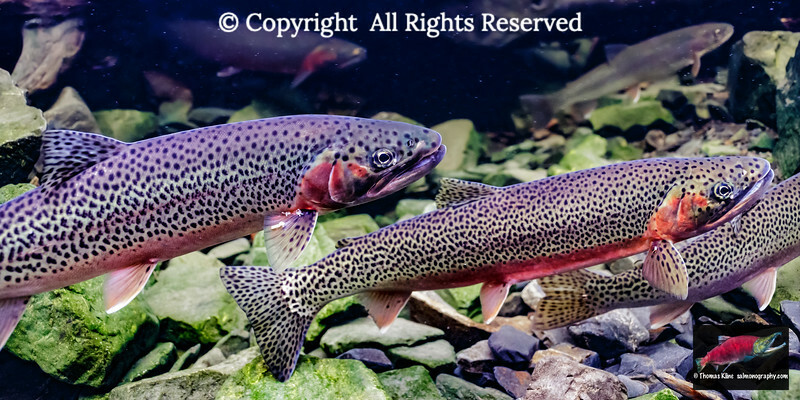 A putative Coastal Cuttroat Trout (Oncorhynchus clarkii clarkii) - Steelhead Rainbow Trout (Oncorhynchus mykiss) hybrid, a.k.a. cuttbow. 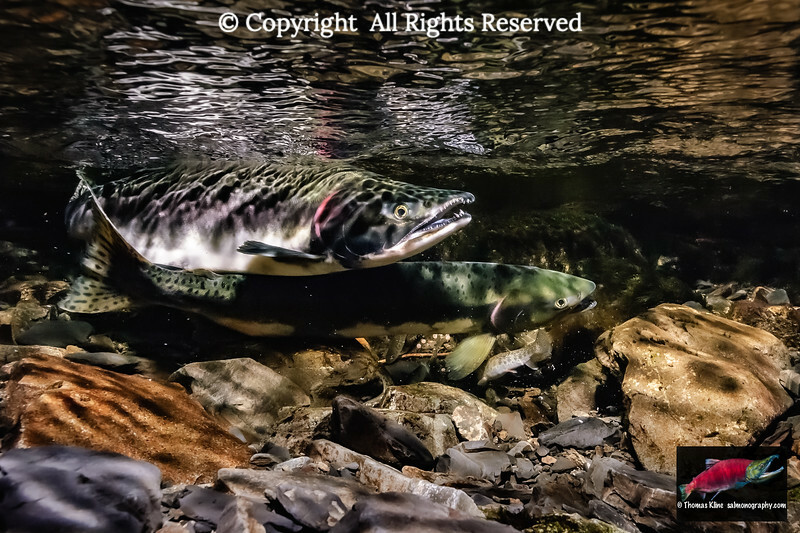 The occurence of cuttbows in the Copper River Delta where this photo was taken is supported by DNA evidence. 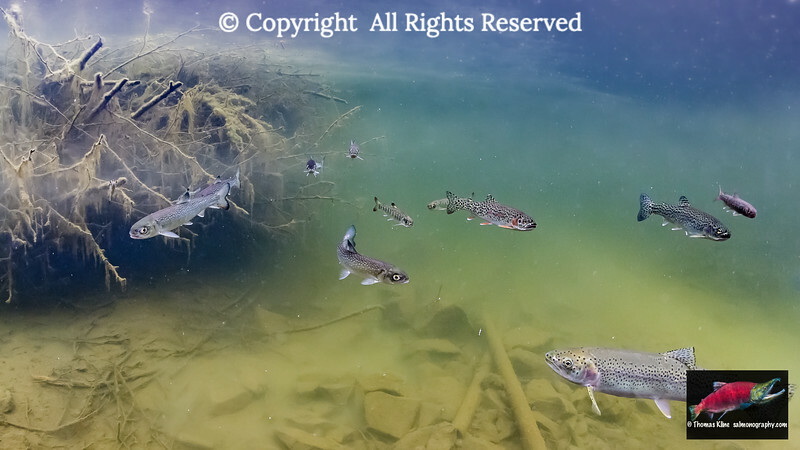 Coastal Cutthroat Trout (Oncorhynchus clarkii clarkii) gather downstream of a beaver dam in a Copper River Delta, Alaska, USA stream during the spring. 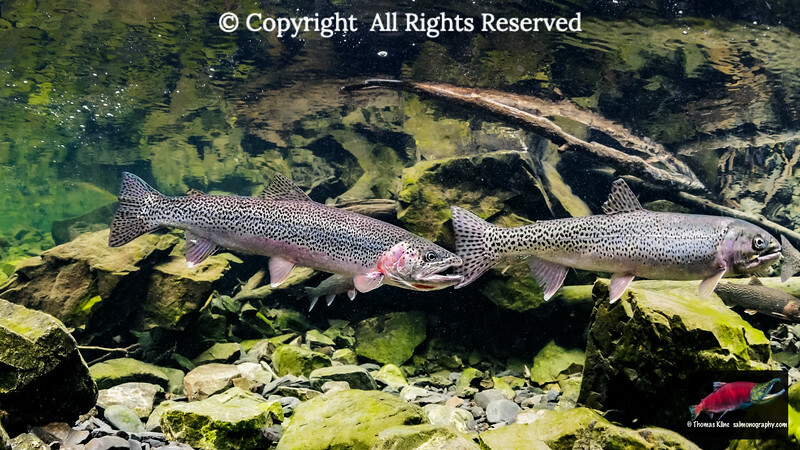 A Coastal Cutthroat Trout (Oncorhynchus clarkii clarkii) and Dolly Varden (Salvelinus malma) in a deep pool. Aspect Ratio = 1:1. 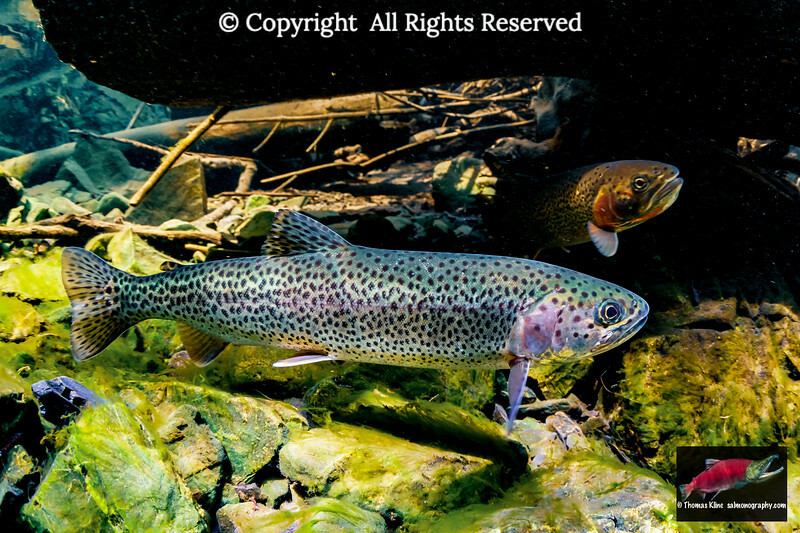 Coastal Cutthroat Trout (Oncorhynchus clarkii clarkii) schooled in tannin stained water. Aspect Ratio = 2:3. 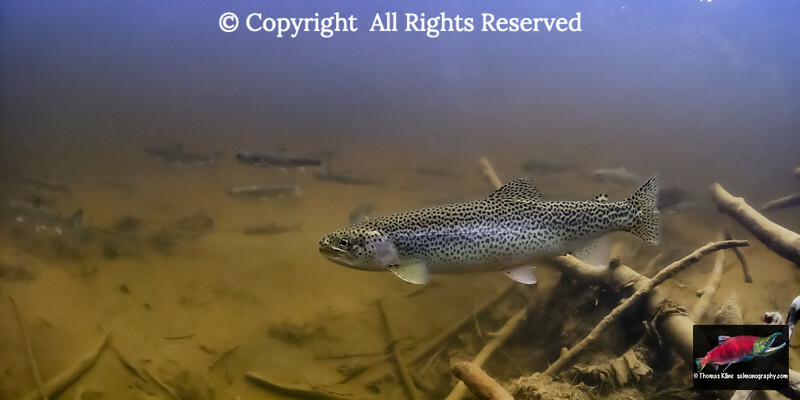 Coastal Cutthroat Trout (Oncorhynchus clarkii clarkii) schooled in tannin stained water. Aspect Ratio = 1:2. 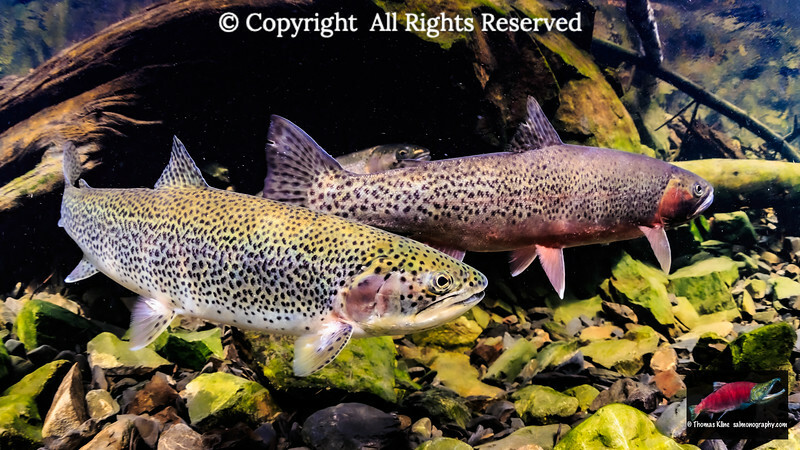 Cutthroat Trout (Oncorhynchus clarkii clarkii) feeding on Pink Salmon (Oncorhynchus gorbuscha) eggs while the female is in the process of covering the redd. Aspect Ratio = 2:3. 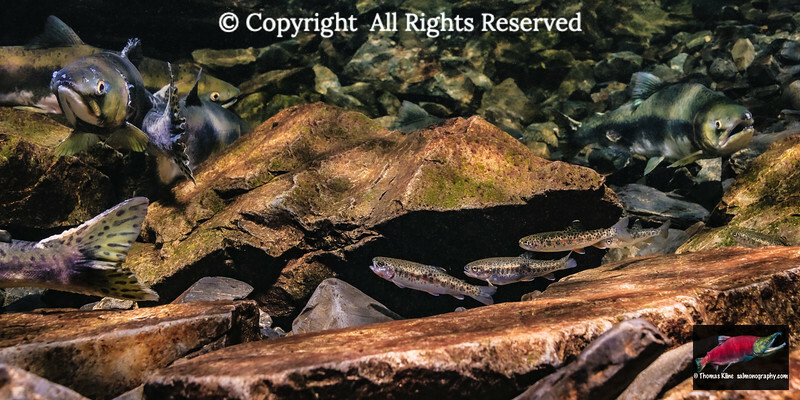 Coastal Cutthroat Trout (Oncorhynchus clarkii clarkii) fry holding downstream of a cascade. Aspect Ratio = 1:2. 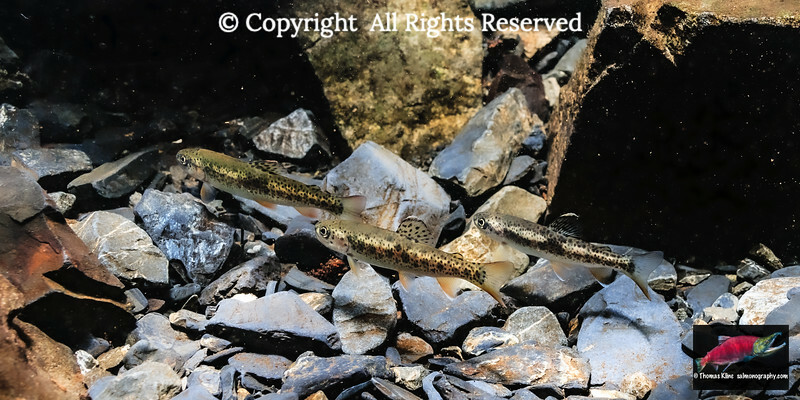 Juvenile Coastal Cutthroat Trout (Oncorhynchus clarkii clarkii) gathered near adult Pink Salmon (Oncorhynchus gorbuscha) in a tributary tream of Prince William Sound, Alaska. Aspect Ratio = 1:2.